Polly in 1962, aged 37. My first thought was Susanna Kaysen, author of Girl, Interrupted, because I love the way she writes. I find it inspiring that she takes a personal tragedy and turns it into something beautiful, her books are so well written and so un-put-down-able (that's definitely a word). I first read Girl, Interrupted when I was 12 or 13, and Susanna Kaysen has been an inspiration to me ever since. And my Year 7 English teacher, Ms Coxon, who once gave an impromptu (and very loud) impassioned lecture about womens rights and sexism in response to a boy laughing about periods. She inspired me to give many drunken impromptu lectures about sexism throughout my adult life, most of them were incomprehensible and probably a bit slurred, but I enjoyed giving them nonetheless. Another thought was Linor Abargil, a former Miss World who was raped just weeks before being crowned. I recently watched Brave Miss World, a documentary about her, and I felt so incredibly inspired. In the documentary, Linor travels the world meeting with other survivors and giving them the chance to tell their stories. It was a heartbreaking film and I cried pretty much the whole way through, but I was struck by just how inspiring Linor was. The documentary is on Netflix so please watch it, I guarantee it will inspire you. I think Caroline Lucas is really inspiring too. She is the first Green Party MP, and an absolutely amazing activist. She seems to give so much time to all the causes she cares about, without ever forgetting the needs of her constituents. Unlike most MPs who seem only to attend local events when forced, Caroline seems to be someone who takes her responsibilities seriously. She is always amazing in parliamentary debates, putting other MPs to shame with her well-researched and coherent arguments. But, for my inspiring woman, I decided to choose someone a little closer to home. The woman I’ve chosen as my inspiration is my Great Aunt Polly. She’s not somebody I knew very well during her life, but the more I find out about her, the more inspiring I find her to be. 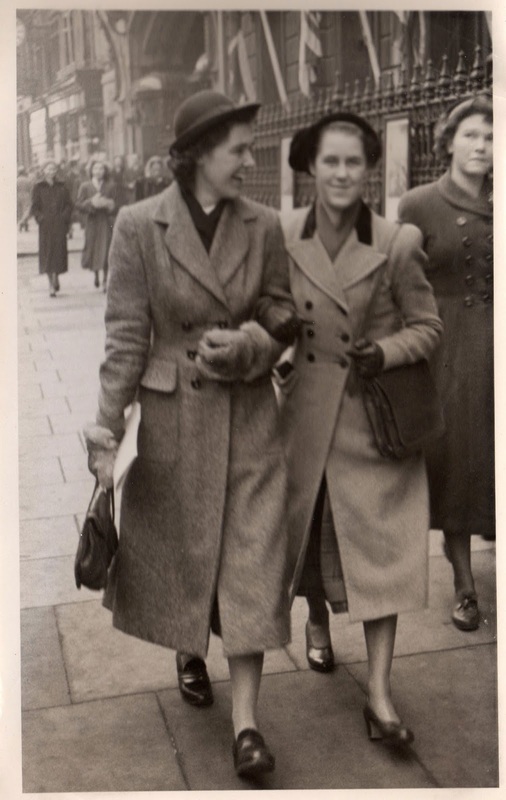 A photo of my Granny and Polly from 1941. I like to think I am a little like her. In that, though I may not replicate the Conservative values of most of my family (thank goodness), I do carry with me some of the passion for activism that I know was important for Polly during her life. I didn’t know much about Polly when I was younger, only that she was a nice old lady, but in recent years I’ve discovered more about her as my dad has shared more stories about his childhood and his family. Aunt Polly was my dad’s cool auntie I think, he certainly speaks of her in very high regard. She gave him his first taste of beer, which though cool in this story will most certainly not be cool when someone gives Ebony beer. She was a bit of a rebel, as far as good old fashioned religious families go. She got into trouble with the police during her school years for refusing to carry her ID card. I’m not sure whether this was teenage rebellion, pacifism, or simple teenage forgetfulness, but my dad thinks there must have been a hint of rebellion for it to have happened more than once. After growing up during a time of intense war propaganda, Polly was one of the early members of the just-established Campaign for Nuclear Disarmament (CND). CND first launched in the 1950s as people began to feel uneasy about nuclear weapons and the horror they could potentially cause. There was a huge protest at Aldermaston (the heart of British nuclear weapon production) which kick started CND and the whole movement against nuclear arms. For my birthday last year I went to the People’s History Museum and stumbled across some photos of those early marches, and the crowds were made up of a huge mix of people. There is a stereotype of what activists look like, they are young and unruly with wild hair, but if you go on these marches, you soon realise that this isn’t true. The young and wild march next to the elderly, business people, and families. This was true of that first CND march, as thousands of individuals joined together in unity against nuclear arms. 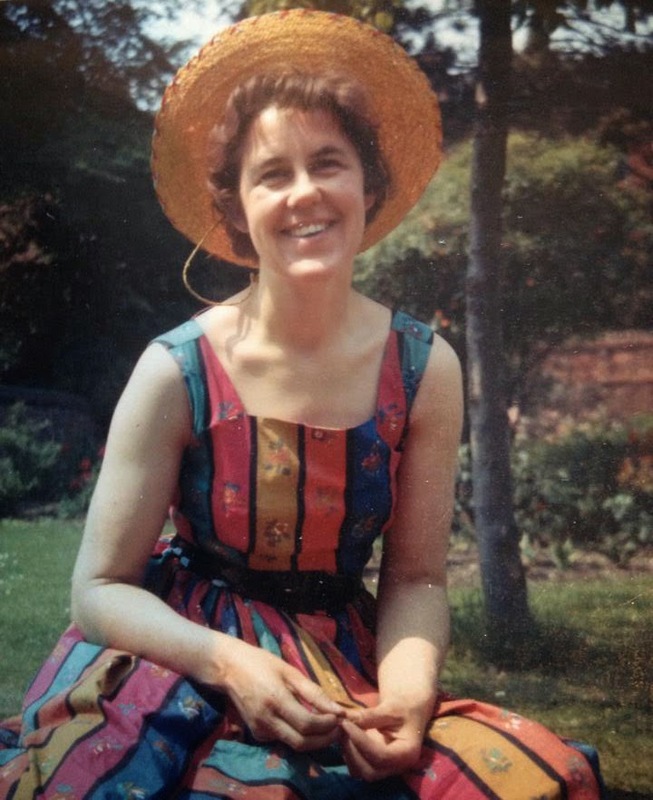 Aunt Polly was there, she would have been around 30, marching alongside her friends all of whom shared her views on politics, equality and social justice. After that first march, Polly went on to attend regular marches at Aldermaston, not giving up on the dream of a less violent world. She continued attending peace marches for decades, and her (now grown up) son told me he remembers accompanying her on one when he was 16. I think there’s something wonderful about encouraging children to get involved in activism, and teaching them that individuals have power and can make a difference. Whilst talking to my dad about Polly this week, he told me that she was a Probation Officer. My dad was a Probation Officer and I asked whether she had inspired his choice of career. He wasn’t sure, but said he went to stay with her for a weekend as a child, and met all of her colleagues which certainly left an impression on him. Polly worked in Probation at a time when women were only allowed to work with female clients and perhaps the odd young boy. She later worked as a Social Worker with a focus on adoption, and then later as a counsellor. I think her work reflects the sort of person she was, caring, but also someone who was driven to improve the world in whatever ways she could, one person at a time. I didn’t know Polly well myself, but I feel that we have a family connection through the generations. And she may not be in my immediate family, but I feel strangely close to her knowing that we share passions and ideas though we live decades apart. It’s nice to be able to look through the family tree and find someone else who felt the same way I do, and someone else who attended protest marches and wrote letters and hoped for change. And that’s why Polly inspires me.